We go through alot of diapers around here. My daughter has been potty training since December of 2010 and is still in diapers at night; hence, we are not there yet. Baby boy just turned one so of course, he is still in diapers as well. Needless to say we are hoping that Hannah learns to potty train SOON so we can only have one in diapers. You know, those little disposable things are expensive little buggers...and I am not yet brave enough to take the cloth diaper plunge. Although, I have considered it. :) When it comes to buying diapers, we go for quality. If we are short on money on a particular week I will resort to purchasing store brand...although I usually pay for it in the long run with leaks and blowouts. Today, I am going to introduce you to Seventh Generation's Free & Clear Diapers...a "green" way to diaper without using cloth. (Sounds like my kind of diaper). I have heard of Seventh Generation before but this is actually the first time I have ever tried their products. One thing that I really do admire about them is the fact that they are trying so hard to get their products into everyone's hands...some companies are just so content to sit and let people come to them. Seventh Generation is NOT one of those companies!! So, for this review, thanks to My Blog Spark and Seventh Generation, I was sent a package of Seventh Generation Free & Clear Diapers in size 4 for review. Having never tried organic/green diapers before I was not sure what to expect in way of color, performance and price. These diapers are cream colored with no color printing on them. So, there are no designs printed on them. I also love how there are so many in a package. Size 4 diapers come 30 per bag, which is nice. They sure do pack alot into one package! :) Especially since my son is taking a vitamin that really loosens him up and we go through alot of diapers each day. So, I found these diapers to be true to size (22-37 pounds and my son is 23 pounds) and they really had a great fit. They are also very absorbent, yet not leak proof. My son has had several blowouts and each one has required a total outfit change. However, if he just wets his diaper we are fine. Another thing I noticed is that they don't have a powdery scent to them like other diapers I have used. So, they smelled really clean to me. 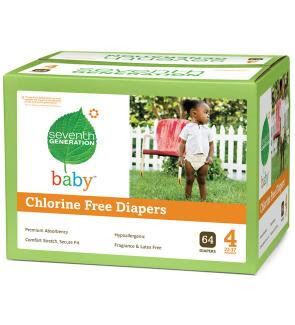 Seventh Generation Free & Clear Diapers are free of chlorine processing, free of fragrances, and free of latex and petroleum-based lotions. (Which was why they smelled so clean to me.) As far as price goes, these diapers retail at about $12.99 per package...which is about $3 more than what I usually pay for my current diapers. I am not sure I love these to the point of wanting to buy them as opposed to my usual brand...purely because of the price and our finances right now. Also, right now you can print out a $2 coupon for these diapers by clicking on THIS LINK. Great deal! So, in my opinion...Seventh Generation Free & Clear Diapers are really wonderful diapers! I love how they look and smell clean and fresh. They are not leak proof when it comes to dirty diapers but wet diapers are fine. I probably would not purchase them myself because the price is a bit higher than what I pay now but if you are into organic diapers, these would definitely be ones you may want to try!! Visit Seventh Generation, then come back here and leave a comment letting me know which product you like the most. You do not have to be a blogger to enter, but you must have a valid email where you can be reached should you win. If you do not leave an email address, it must be where I can easily find it. This giveaway is open to US residents and will end 8/1 at 11:59 pm EST. The winner will be chosen using random.org and will be notified by email. The winner will have 48 hours to respond, or another winner will be selected. 1. "Like" Seventh Generation on Facebook. 2 entries, so 2 comments. 2. Follow Seventh Generation on Twitter. 1 entry. Disclaimer: I was not monitarily compensated for this post. The above mentioned product, giveaway and information has been provided by Seventh Generation and MyBlogSpark. All quotes are from the Seventh Generation website. All thoughts and opinions are 100% mine. I also would like to try their Baby Laundry. Their free and clean laundry soap looks great. I like the Free & Clear: Natural Laundry Detergent. You need less of it and it’s truly free & clear! We like the Seventh Generation Antibacterial Wipes as well as the baby wipes. Great product! I love the antibacterial wipes -- I didn't realize there was a greener option, yay. I like the baby wipes. I would love to try the carpet cleaner . We use a lot of their products already, but I'd like to try their baby wipes! I like all the baby products they offer, especially the laundry detergent. Would love to try their baby laundry detergent as well. I like their baby wipes the best! I Love the diapers. Use them all the time. also love the grapefruit spray cleaner. Left comment on Olivella review! I'm also interested in their free & clear baby wipes. I'd love to try the Free & Clear Natural 2X Concentrated Laundry Liquid! I would love to try the Chlorine Free Baby Wipes! I also like the baby wipes! 6/21: I voted 4 u on Picket Fence Blogs. 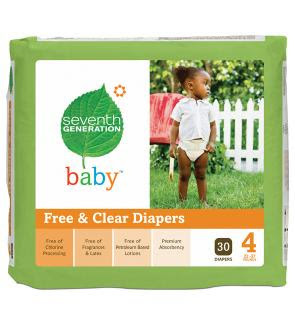 I visited Seventh Generation and i'd like the Free and Clear Diapers & Training Pants and Chlorine Free Baby Wipes! I liked Seventh Generation on FB! I followed @SeventhGen on twitter. I "Like" Seventh Generation on Facebook as latanya t.
I like their free and clear wipes. I would love to try the Free & Clear Laundry detergent. I like the liquid fabric softener on Seventh Generation.